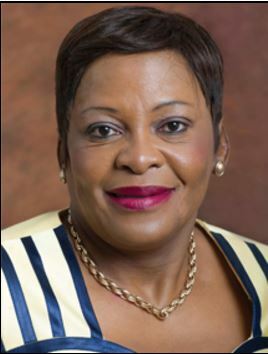 Ms. Nomvula Mokonyane, Minister of Water and Sanitation and former Premier of Gauteng Province, was born on June 28 in the West Rand township of Kagiso. She is the youngest in a family of 12, with six sisters and five brothers. She matriculated at Masupatsela High School, Kagiso. A veteran of the struggle, Nomvula Paula Mokonyane participated actively in the fight against apartheid from the tender age of 15. A founder member of the Congress of South African Students (Cosas), she was an organiser in the Federation of Transvaal Women and a leader of the Kagiso Residents’ Organisation. She was also active in trade unions as a shop steward and leader of the Commercial, Catering and Allied Workers’ Union of South Africa (now Saccawu). During this period, she was continually harassed and detained by the apartheid security police. Since the advent of democracy in South Africa in 1994, Ms. Mokonyane has served in a number of leadership positions in the ANC and its Alliance structures, including being a member of the Central Committee of the SA Communist Party; Executive Committee Member of the ANC Women’s League and National Executive Committee member of the ANC. Minister Mokonyane served in the Gauteng Legislature from 1994 in various portfolio committees before she was appointed MEC of Agriculture, Conservation and Environment in 1996. She became MEC for Safety and Liaison from 1999 to 2004, and was appointed Housing MEC between 2004 and 2009.In 2009, after the general elections, she was appointed Premier of Gauteng. Ms. Mokonyane received training in Local Government and Planning Management and Community Development in Sweden. She completed a certificate course in Emerging Economics at the Wharton Business School at Pennsylvania University, and studied leadership and governance at Harvard University in the USA. Minister Mokonyane firmly believes in collective leadership and teamwork. She is Catholic and an active member of her social networking club.